The New York State Energy Research and Development Authority (NYSERDA) has been working for a couple of years now to develop an electric vehicle website that is useful to EV buyers as well as dealers, planners, installers and fleet operators. That site was recently launched and can be found at www.nyserda.ny.gov/chargeny. ChargeNY of course is the statewide program working to accelerate the use and benefits of EVs in New York. The state’s goal is to establish a statewide network of up to 3,000 charging stations to accommodate an anticipated 40,000 plug-in vehicles on the road. We anticipate this new website to be a useful tool and resource. It will certainly be utilized as we develop the Capital District EV Charging Station Plan and assist local communities in becoming EV-ready. 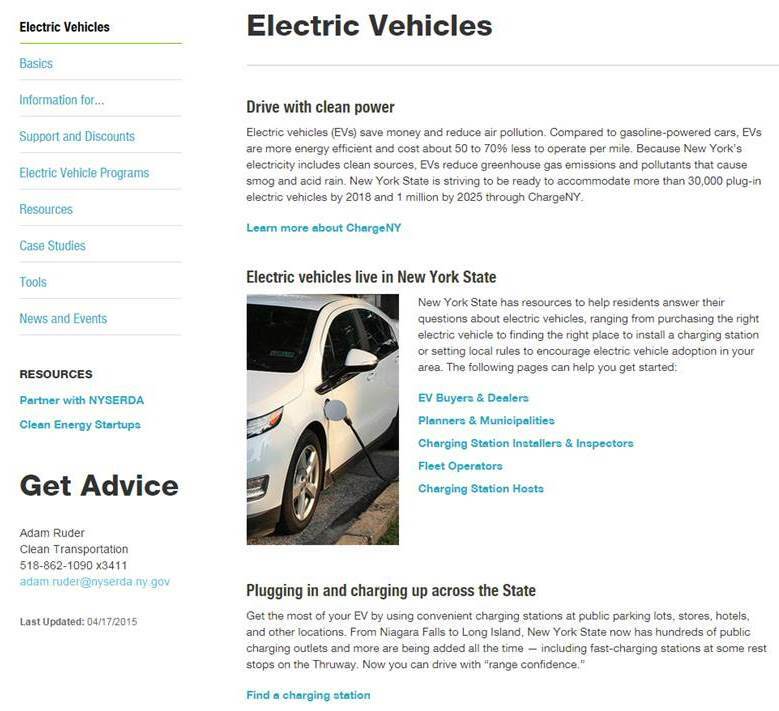 We installed a button on our homepage to help connect our stakeholders and others directly to NYSERDA’s EV website. We encourage anyone interested in EVs or working to promote EVs to visit the site. If you have a project or program idea that you think would promote the deployment of EVs, please send them to jceponis@cdtcmpo.org.